Today, I’m sharing with you this recipe that uses roasted poblanos peppers and peanuts, together with the rest of the ingredients form a creamy and mild sauce that covers the corn tortillas filled with the shredded chicken breast. They are usually served with the lettuce, cheese, and radishes, and all of those fresh components make a delightful combination in your mouth. The toppings are an essential part of the whole recipe, so don’t skip them. Trust me; you are going to like this dish. 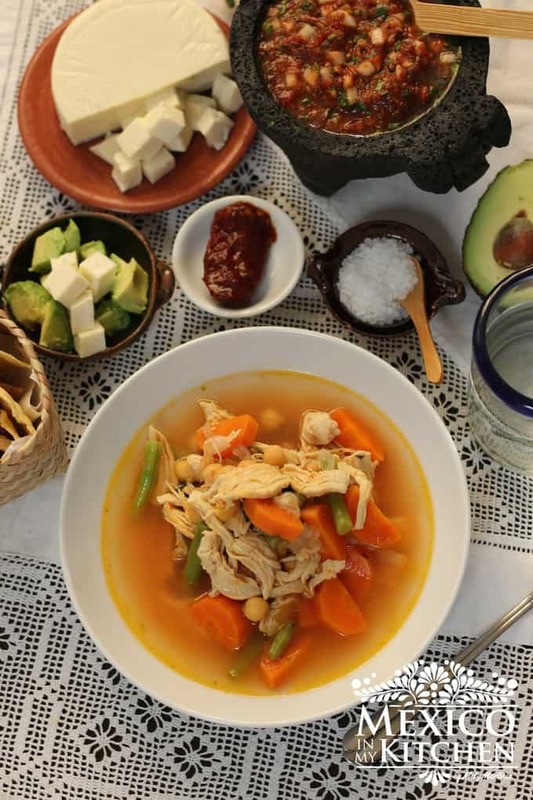 I found the recipe many years ago on a book I used to owe; “Los Mejores Antojitos Mexicanos” by Patricia Gonzalez, somehow, I lost that book during my several house moves, but I remember the ingredients and made it my own according to my own taste. 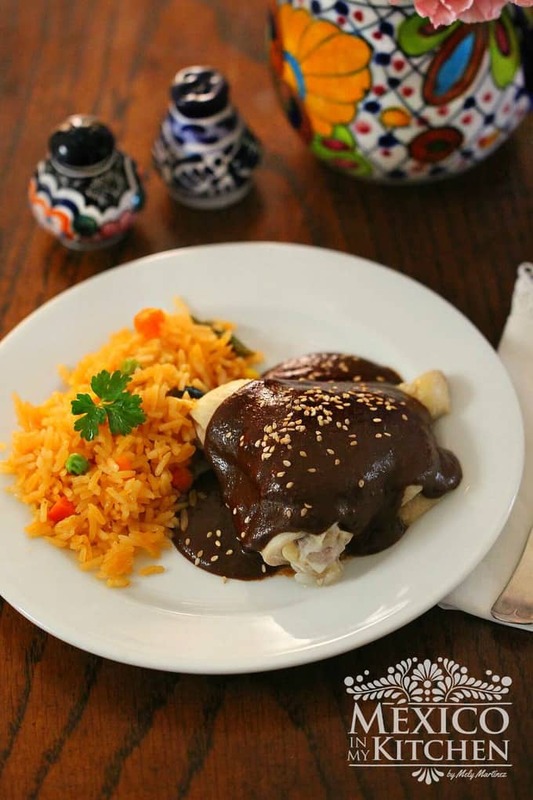 They are called “Enchiladas- Pachuqueñas”, referring to the city of Pachuca, the capital of the State of Hidalgo. It is located about 50 miles from Mexico City. And, despite being so close to a big city such as Mexico City, the atmosphere is very different, quite calm and relaxed. Its climate is semi-arid with cold nights and pleasant days. One of the most famous dishes of the city is known as a paste, a type of empanadas with a filling of potatoes and meat, and enchiladas mineras, very similar to those I have here on the blog. Heat 1 Tablespoon of oil in a medium-size frying pan and pour the sauce to cook. Bring to a boil, then reduce to a simmer, whisking occasionally, until the sauce has thickened slightly, about 6-8 minutes. Season with salt and pepper. If you prefer your sauce less thick, add 1/3 cup of chicken broth and stir to dilute it. Once your sauce is ready, set aside while you fry the tortillas. In a medium-size skillet, heat the rest of the oil over medium-high heat. Slightly fry the tortillas, one by one, just enough to soften and warm them. Have a plate covered with paper towels ready to place the tortillas after frying to absorb any excess oil. To form the enchiladas, fill each tortilla with a couple of tablespoons of shredded chicken; roll up tightly, and place seam-side down on a plate (I like to serve 3 enchiladas per plate). Once the three tortillas are rolled, cover with a few tablespoons of the sauce. Top with the shredded lettuce, cheese, and radishes. Poblano Peppers Enchiladas, Today, I’m sharing with you this recipe that uses roasted poblanos peppers and peanuts, together with the rest of the ingredients form a creamy and mild sauce that covers the corn tortillas filled with the shredded chicken breast. 1 Chicken breast cooked and shredded seasoned with salt and pepper. Mix milk and cream in a small bowl and soak the slices of bread in it until the bread has softened about 2-3 minutes. Add the milk and cream mix with the softened bread into a blender, along with the roasted Poblano strips, white onion, and roasted peanuts. Process until you have a very smooth and creamy sauce. To form the enchiladas, fill each tortilla with a couple of tablespoons of shredded chicken; roll up tightly, and place seam-side down on a plate (I like to serve 3 enchiladas per plate). Once the three tortillas are rolled, cover with a few tablespoons of the sauce. Top with the shredded lettuce, cheese and radishes. *You can use White sandwich bread instead of the slices of Mexican rolls or french baguette. ** These are not spicy enchiladas, but you can add a jalapeño or Serrano pepper to add some spiciness. OOhhhh these look so good and the recipe seems easy enough. Thank you. Hi Mely. This is Jorge from Hispanic Kitchen. I hope you're well. Beautiful dish! I featured it on the HK Facebook page and used the photo to illustrate. I hope that is OK. The post links back to your site. I think our followers will like it very much. I used the one sold as "Mexican Cream", but you can use sour cream instead. I have to try this because I love the creamy salsa verde that we already use. Yours sounds exceptionally great. I just love your dishes, I've never thought about making enchiladas this way, I have to try them but with cactus instead of chicken since I don't eat meat. This was delicious! I did use heavy cream because I had it on hand, but will try to use sour cream or Mexican créme next time. I did pair with halibut instead of chicken and it was great! Light and paired well. Thanks for posting! Love the idea of serving with Halibut. Thank you for giving us such a great suggestion. Provecho! I am in the process of making this. There is no mention of how muck garlic to use. Also do you heat it up or eat it at room temperature? Use one garlic clove. You serve them right away, they should be warm. Provecho! I was so happy to find this recipe! It reminded me of going to the Feria de San Francisco with my friends when I was young and living in the D.F. to watch the bullfights and the big charreada back in the early 80’s. We stuffed eight people into my 1974 Volkswagon and hit the road. We ate the most delicious food, and I remember eating chilaquiles for breakfast with this wonderful peanut sauce. I had forgotten about that until I saw your recipe and realized that this must be really close. I have one question, though: reading the recipe I’m not clear how much bolillo I need to use. Is it 1 1/2 cups? The salsa uses 1 & 1/2 slices of bread. The slices should be about 1/2 thick. Thank you for visiting. Actually, that was a mistake on the instructions, this recipe doesn’t use garlic. Thank you for letting me know. I already edited the instructions.